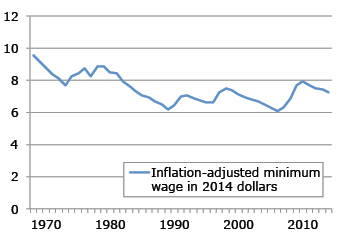 The federal minimum wage is $7.25 per hour, up from $1.60 in 1968. Yet it has eroded in terms of what it can buy. Its value has fallen, because, despite more than a four-fold increase in the minimum wage over nearly a half century, it has not kept up with inflation. The 1968 value, when translated into 2014 dollars, was $9.58 per hour, as shown in the chart (left) from the Center on Wage and Employment Dynamics at the University of California, Berkeley. In other words, today’s minimum wage, at $7.25, buys about 25 percent less than it did in 1968. As the federal minimum wage has eroded, Sylvia Allegretto, the Center’s co-director, noted that numerous states and municipalities stepped in to raise their minimum wage last year. They include Arkansas, Delaware, Hawaii, Massachusetts, Rhode Island, and West Virginia, as well as Louisville, Kentucky, and San Jose, California. Others are kicking the idea around. “We’re even seeing activity in the South where we’ve never seen it before,” Allegretto said. The erosion in the real minimum wage exceeds that experienced by low-income workers overall. Between 1979 and 2011, for example, there was a 4.3 percent drop in the inflation-adjusted wages of all U.S. workers with earnings in the bottom 10 percent, while the group above them on the income ladder saw a slight 1.3 percent increase. The nation’s highest-paid groups saw wage gains of 20 percent to 30 percent over that time. Minimum wage workers nationwide are advocating to more than double the federal minimum wage to $15 per hour. Opponents argue that higher labor costs will reduce employment. Proponents argue that raising it would pump more money into the economy by giving low-paid workers more money to spend. Increasing the minimum wage is controversial. But the bottom line for people earning it is clear: they can buy 25 percent less today than their predecessors in 1968 could buy. Interesting development. In The Netherlands, however, the minimum wage is adjusted alongside the inflation.